The Valved Tee™ Adaptor makes it simple to deliver aerosolised medication to your ventilator patients. The Valved Tee™ Adaptor makes it simple to deliver aerosolised medication to your ventilator patients. Used in conjunction with a small volume nebuliser, the Valved Tee offers a safe and effective way to introduce the aerosol into the circuit. 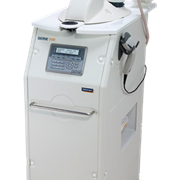 Unlike other tee adapters that require time-consuming and potentially hazardous breaks in the system, the Valved Tee is a permanent part of the ventilator circuit. 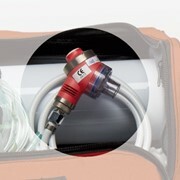 Its unique valve opens and closes as the nebuliser is inserted and removed. For introducing aerosolised medication into a ventilator circuit. 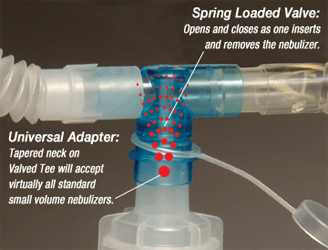 Opens automatically when the nebuliser is inserted into the tee. The nebuliser will hold firmly when pressed and twisted into place. 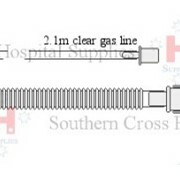 Closes automatically when the nebuliser is removed. Maintains a closed ventilation system. 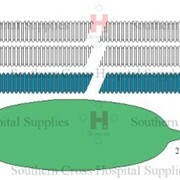 Simplifies the delivery of aerosolised medication to ventilator patients. 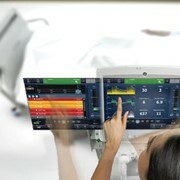 Closed system minimises risk of contamination to patient and clinician. 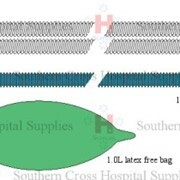 Reduces the risk of pressure loss, FiO2 level, and tidal volume breath. 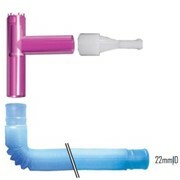 Anti-drip configuration minimises drainage from ventilator tubing into nebulizer bowl. 22 mm O.D. x 22 mm O.D. 22 mm O.D. x 22 mm I.D. 15 mm O.D. 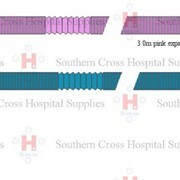 x 15 mm I.D. 10 mm O.D. x 10 mm I.D. 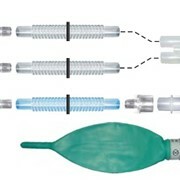 The nebuliser port is the same size in all three versions.